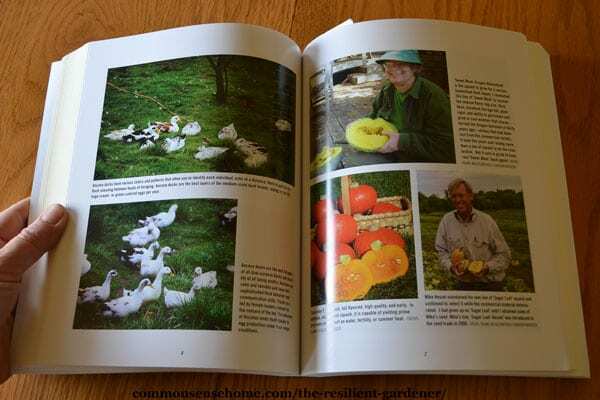 “The Resilient Gardener – Food Production and Self-Reliance in Uncertain Times” by Carol Deppe came onto my radar while reading Harvey Ussery's book, “The Small-Scale Poultry Flock“. Harvey mentioned Carol's approach to feeding her ducks using garden crops to dramatically reduce purchased feed consumption, and I wanted to know more. Coupled with the duck information was an array of topics unlike any other gardening book I've ever read. The first information that caught my attention in this book was a brief discussion of how The Little Ice Age forced farmers to diversify to survive. Monocrops tend to be hard hit by weather changes. This is a lesson that we need to heed today. Too much of our food calories come from a small handful of crops that need specific weather to produce. We've been blessed with a long period of relatively stable weather – BUT – weather, being weather, changes. Many different food sources means that something is likely to survive – and we won't go hungry. Another interesting snippet was Carol's story about “bitter and wormy nuts” going to waste. It turns out that the nuts were good – people just didn't harvest them properly. Walnuts turn bitter if not removed from their husk. (More on walnut harvesting here.) The hazelnuts get worms if left on the ground. Once she learned the right way to harvest, she had a stash of free food. The seed saving and breeding tips in The Resilient Gardener are also extremely detailed. There is extensive discussion of the best uses of specific varieties of potatoes, corn, beans and squash. Her decades of experience as a plant breeder are quite evident. (Carol's first book was “Breed Your Own Vegetable Varieties: The Gardener's and Farmer's Guide to Plant Breeding and Seed Saving“.) She focuses on high calories for amount of labor, ease of storage, and ease of cooking. As an aging gardener, Carol understands the importance of a less labor intensive garden. Because of her dietary needs, she's also developed corn varieties that lend themselves well to baking with “as is” – with no added binders or other ingredients. This is great for those avoiding gluten. Lots of folks talk about what to feed chickens (this site included), but relatively few have similar information for ducks. Unlike chickens, ducks are more hesitant to eat new foods. They don't eat the wide range of foods that chickens do, either. They do, however, eat some things that chickens won't – such as big, honking slugs. I've seen several gardening/permaculture references that note that an excess of slugs is a deficit of ducks. In the Pacific Northwest, big banana slugs can quickly devastate a garden. Ducks view large slugs as tasty treats. They start at one end and keep swallowing until the entire slug is gone. Here in northeast Wisconsin, our small flock of runner ducks makes regular bug and slug control runs through the garden. We only have small slugs (less than an inch), but more than enough of them. The ducks get excited about every slippery slug morsel that they find. The ducks are a wonderful addition to our garden. This year we're supplementing their regular food with squash and potatoes. You can read about their training as our garden pest control crew here. The Resilient Gardener also includes an extensive section on cooking duck eggs, which is helpful because they do behave differently than chicken eggs. I'm looking forward to giving her suggestions a try when our duckie ladies start laying. The photos on the left side show Carol's flock of Ancona ducks, which all have unique plumage patterns that allow you to identify individuals at a glance. 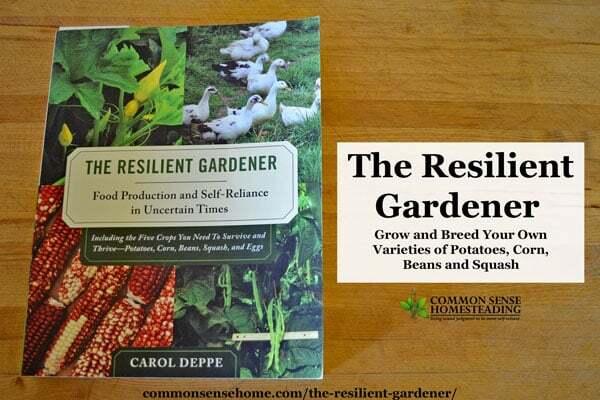 The subtitle of The Resilient Gardener is, “Including the Five Crops you Need to Survive and Thrive – Potatoes, Corn, Beans, Squash, and Eggs”. There is virtually no information on growing other crops. Planting, crop care and harvest instructions are catered to the author's Pacific Northwest climate. My climate here in the upper Midwest is quite different, so there's a fair amount of material that simply isn't relevant. From the author's descriptions, it sounds like a uniquely challenging area for gardening. In an ideal world, I'd love to see the title changed to let people in that climate know that this book would be a resource tailored specifically to their needs. Perennial crops and permaculture are not included. I believe both are essential in truly resilient gardening. Soil improvement is barely touched on, as the author claims that she must break a new garden every couple of years due to a specific soil crustacean. There's heavy reliance on mechanical cultivation, which seems to be at odds with the idea of “resilience”. She talks about dealing with the “pot effect” of cultivation, where plants can't draw water from the subsoil because it has no capillary connection to the topsoil. That's know to most folks as hardpan, and it's caused by excessive tilling. I don't understand the author's love of her microwave, and her overuse of the word “supreme” in her recipes. It was like a flashback to my grandmother's recipe book, where about half the recipe titles included the word, “surprise”. Why spend so much time telling me about the awesome culinary properties of potatoes, and then turn around and give me a recipe that amounts to, “microwave potatoes and dump a can of tuna on top”. Is The Resilient Gardener Right for You? 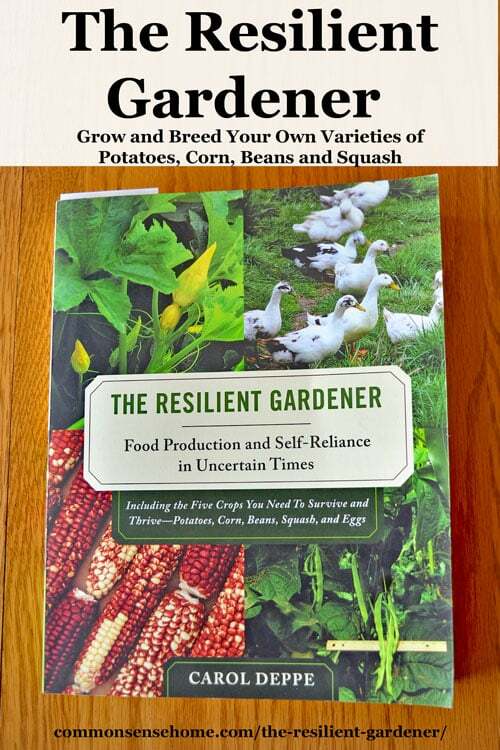 The Resilient Gardener is a solid guide for growing potatoes, corn, beans, squash and eggs in the Pacific Northwest. It reads like a visit with an older gardening friend. The book does a good job of addressing unique challenges met by Pacific Northwest gardeners. If you want to grow crops that you can store with minimal processing, this book is a great choice. If you think you'd like to save seeds or breed your own varieties for the featured crops, it's got you covered. Want to know which varieties of potatoes, corn, beans and squash are best for which culinary uses? There are more suggestions and descriptions than I have found in any other gardening book. Want to encourage your ducks to forage, eat a diverse diet and help in the garden? Check out chapter 9. Carol and I might not agree on everything, but we still have plenty of common ground.